Fun and festive Gluten-Free Vanilla Birthday Cake Donuts that are soft, fluffy, bursting with vanilla, and smothered in a sweet glaze. 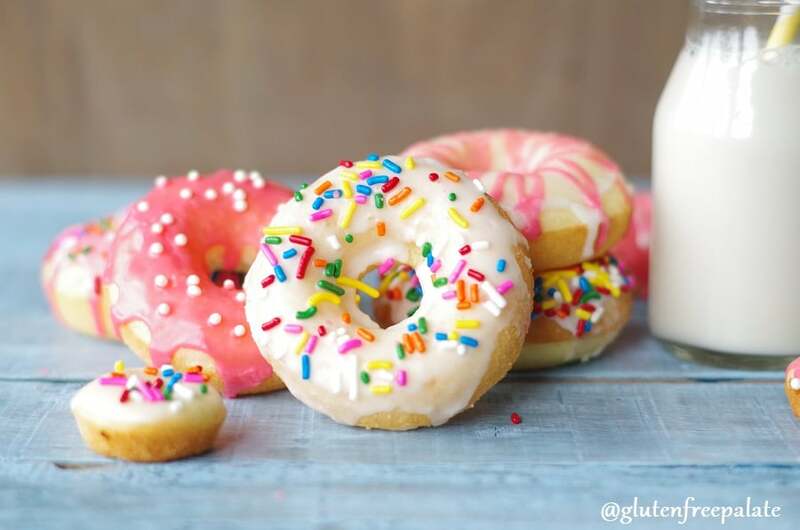 Enjoy these gluten-free vanilla donuts plain or top them with sprinkles for an extra colorful treat. I’ve mentioned this in previous posts – my girls and I enjoy a donut every Friday. It helps us wind down for the week and rewards us for getting up and getting ready for the day on time. These gluten-free vanilla cake donuts are one of our favorite gluten-free donuts. Gluten-free donuts are an extra special treat that we save for Friday morning’s. We like to make up a big batch of gluten-free donuts and freeze them for the future weeks. When we run out of gluten-free donuts, we bake up another batch. These Gluten-Free Vanilla Birthday Cake donuts are incredible any time and aren’t just for celebrating birthdays. You can decorate them with frosting or enjoy them plain. Gluten-Free Vanilla Donuts are super easy to make if you have a good recipes, so I hope you’ll try these and see just how simple they are to make. 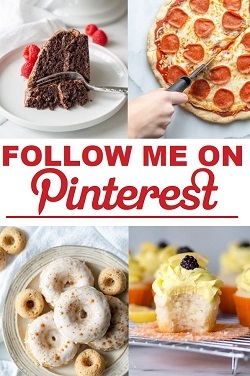 When you do, please stop back by and let me know what you thought and what you topped your gluten-free donuts with. We rotate the types of gluten-free donuts we make, adding in variety and giving me a chance to test out new donut recipes. 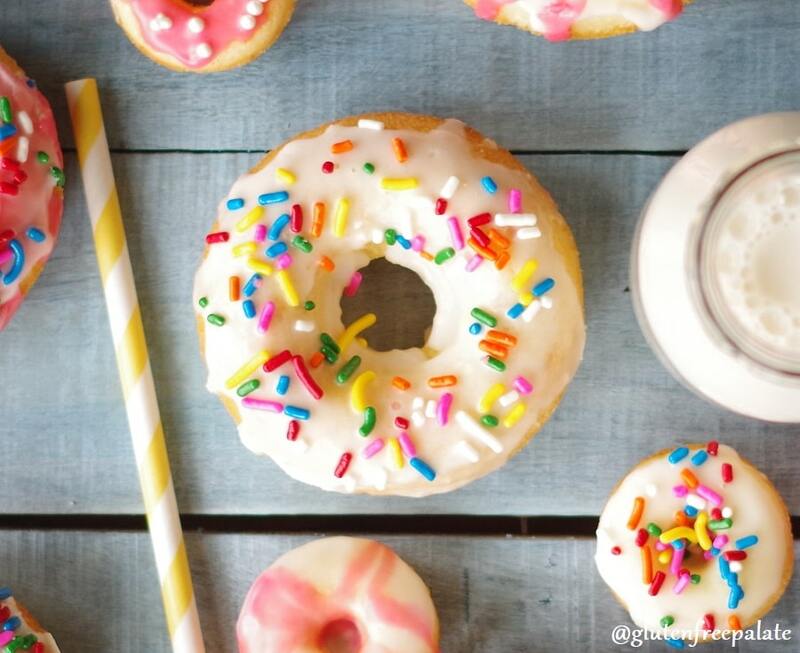 My girls like to dip these gluten-free vanilla cake donuts donuts in glaze and add sprinkles. I love it when they bake with me and they love being rewarded with a sweat treat for helping. The girls and I devoured these Gluten-Free Vanilla Birthday Cake Donuts straight from the oven. The second batch made it to the glaze and sprinkle process and were frozen for the next week. The texture in these gluten-free vanilla donuts is perfect. There is a little give with the pick the donut up. It’s tender, and melts perfectly in your mouth. 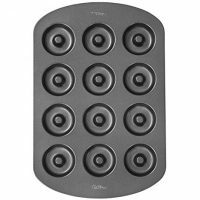 Do I have to use a donut pan? If you don’t have a donut pan, I recommend you get one. 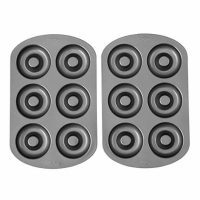 But for now you can use a muffin pan or a mini muffin pan. Just note that the cooking time is lower with a donut pan because the donut dough gets contact all around, including in the center with the donut pan. 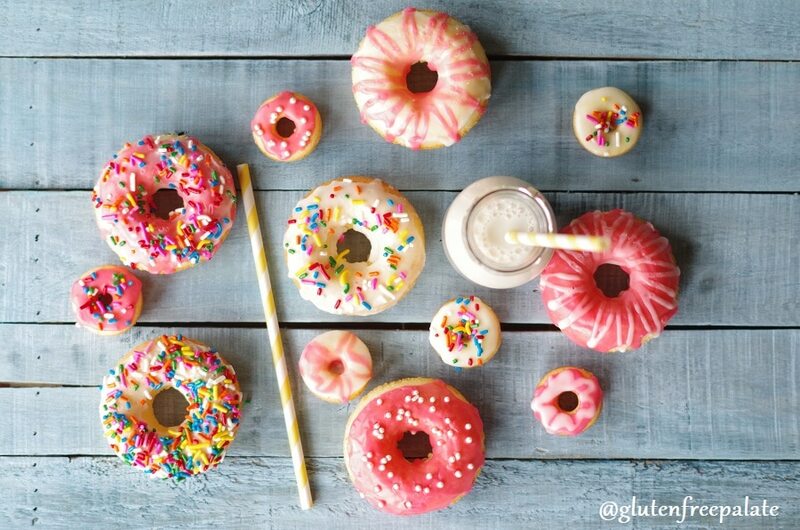 Can I make these gluten-free donuts dairy-free? Absolutely. Substitute the butter milk for your favorite dairy-free milk and add in a teaspoon of vinegar. Let them mixture sit for 5 minutes before adding it to the batter. It will help it thicken up and get lumpy. Use dairy-free milk in the glaze. Enjoy! These gluten-free vanilla cake donuts are insanely simple to make. They bake up in less than ten minutes and are tender, flavorful, and they hit your donut-loving taste buds in all the right places. You can have fun with the glaze by adding in color, or you can use different types of sprinkles. One year for Halloween we made the glaze purple and topped the donuts with orange sprinkles. They were fun to hand out to friends on Halloween. Do these gluten-free vanilla cake donuts freeze well? Yes, these gluten-free vanilla cake donuts freeze well. We often double the batch and freeze the rest for our Friday donut days. That way I don’t have to make a fresh batch each week. Simple take them out the night before, or defrost them in the microwave in the morning. What gluten-free sprinkles do you recommend? Sweetapolita makes great gluten-free sprinkles. Let’s do Organic has a couple of varieties as well. Most sprinkles don’t have wheat or gluten in them but they are usually processed in a facility that processes other glutinous ingredients. Make sure to check labels for allergen information. 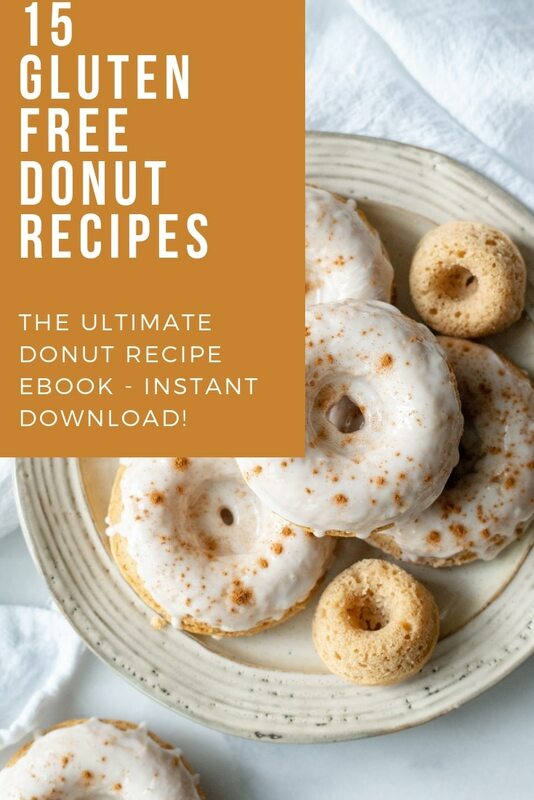 If you like donuts, you might also like my Gluten-Free Chocolate Cake Donuts, Gluten-Free Vegan Chocolate Espresso Donuts, or my Gluten-Free Gingerbread Donuts. For more gluten-free donuts, check out these Glazed Yeast Raised Gluten-Free Donuts from Gluten Free on a Shoestring. Did you make these gluten-free cake donuts? Please let me know what you think in the comments below. Also, if you have a question that I haven’t already answered above please leave a comment and I will get back to you. Happy donut making! Fun and festive Gluten-Free Vanilla Birthday Cake Donuts that are soft, fluffy, bursting with vanilla, and smothered in a sweet glaze. Preheat oven to 425°F. Grease two six-serving donut pans; set aside. In a large mixing bowl, mix the flour, sugar, baking powder, and salt. In a separate small mixing bowl, whisk the buttermilk, eggs, vanilla, and oil. Add the wet ingredients to the dry ingredients and whisk until combined. Spoon the batter into the prepared donut pan filling about 1/2 full. The batter should not cover the center of the donut, where the hole will go. Bake for 7-9 minutes or until the donuts rise and set. Remove from oven and carefully remove the donut from the pan. You may need to use a spoon or a rubber spatula to loosen them if they stick. Cool donuts on a wire rack for 5 minutes. Place your wire rack over a cookie sheet or piece of parchment paper. For the glaze: In a separate small mixing bowl, combine the powered sugar and milk. Heat covered in the microwave for 30 seconds. Remove from the microwave and stir until all sugar lumps are dissolved. One at a time, dip the tops of your donuts into the glaze. Place your donut back on the rack and repeat until all donuts have been dipped. Repeat 1-2 more times until your glaze is white. After the last dip in the glaze, dip the donuts into the sprinkles. Store donuts in a airtight container at room temperate for up to three days. When working with or measuring gluten-free flour, spoon the flour into the measuring cup and level. Do not scoop your measuring cup into the gluten-free flour. The best method really is to weight it but I don't have the ingredient weights for all my recipes yet. I loveee baking donuts and I love that you have a donut tradition! How cute! Thank you Kristy! Hope you had a nice Easter. Haha 🙂 I love donuts too! Wow those are so pretty and colorful! I haven’t had a donut with sprinkles since I was a kid, so fun! Thank you Emily. They are just as tasty as when we were kids! there is no such thing as too many sprinkles! 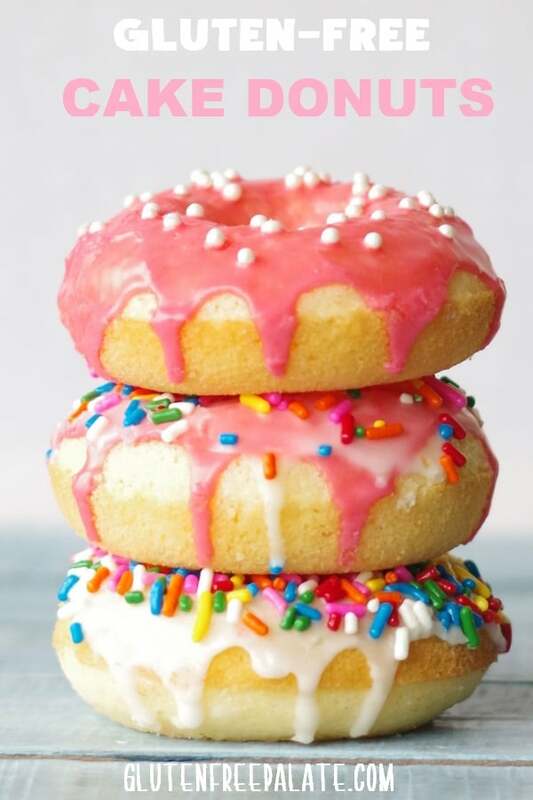 My b-day is coming up soon, and I really want these donuts for my birthday breakfast! These are so fun! 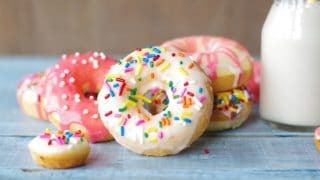 My husband loves sprinkle donuts- I have to make these for him! love cake donuts or anything donut related actually. especially when they are topped with as many sprinkles as these! Ugh not to sound like a generic comment but…. THIS LOOKS SOOOOOOOOO DANG GOOD! Vanilla + Rainbow Sprinkles = MY ABSOLUTE FAVORITE COMBO EVER! Do you have to use a doughnut pan? You could probably use a muffin pan or a mini muffin pan. Just note that the cooking time is lower with a donut pan because the donut dough gets contact all around the round donut pan. I’ve had donuts on my mind all week long. These look fantastic! And my kids love sprinkles, so I know these will be a hit! Thank you Julia. I have to make another batch today due to my girls devouring them and begging for more. Oh! These look so good!! These are so pretty! 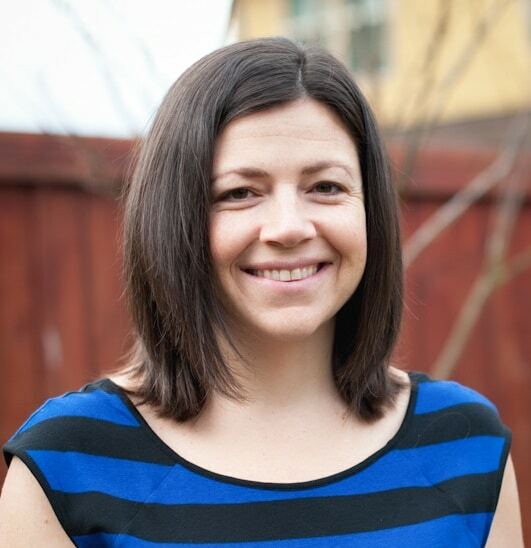 Thanks so much for sharing them with us at Savoring Saturdays last week. Have a great weekend. These look amazing! Can you recommend any gluten free sprinkles? Sweetapolita makes great gf sprinkles. Let’s do Organic has a couple of varieties as well 🙂 Hope that helps! I have made a number of gluten free donut recipes lately. This one is by far the best. I made them dairy free by using almond milk and vinegar. Excellent! So glad you liked them! Thank you for letting me know. Thank you so much for this recipe. My daughter was diagnosed with celiac 5 months ago, and our tradition is to always have donuts for her birthday breakfast. You saved the day. I was afraid that I would have to try a bunch of recipes before I found a keeper, but your recipe turned out wonderful. My husband says these are better than Dunkin’ Donuts, and we are not easy to please. I used the Babycakes mini donut maker, and cooked each batch for 3-4 minutes. I made a chocolate icing with melted chocolate in it. Thank you for saving our birthday tradition. Thank you so much for letting me know! I love hearing about reader experiences. Tell your daughter happy birthday from me! Thank you so much Chrystal! I tried this recipe, it was great! These look awesome! I’ve been gluten free almost my entire life and I have always said that if i found out I could suddenly eat gluten, the first thing I would grab is a doughnut! I’ve just never had good gf ones. Could we sub coconut oil for the vegetable oil in the recipe? My flour blend doesn’t use gum, and this recipe doesn’t need it. You can use a flour blend with gum in it, and it won’t hurt it. Would these freeze well? I would like to make up some for my son to be able to take to school when someone brings cupcakes for a birthday. He is allergic to wheat, gluten, egg whites, and soy, so finding something pre-made or a recipe that works is hard. Can you substitute just regular milk for buttermilk? 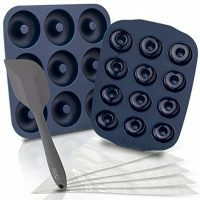 I just got my donut pan and am eager to try these tomorrow without having to go to the store! You can use regular milk. The texture will be slightly different, but they should still be tasty. Just made these and they taste great but they came out a little dry. Any suggestions on what I might have done wrong? Thanks so much! I’m so glad I found your website! – Did follow the directions and use the same flour blend? – It’s warmer out, so oven temperatures are sometimes higher then they say, and will cook the donuts quicker. – Did you spoon the flour into the measuring cup? If you scoop and level, you’ll end up with more flour then needed. I made these today for my sons gf b-day breakfast and they turned out so yummy! I love how simple this recipe was. I used a frosting bag to squeeze the batter into the pan and that made a perfect shape. What oil do you recommend? Thank you! Looking forward to trying these! My current preferred oil is avocado oil. It is healthy and has no taste 🙂 You can use your oil of choice. These keep up to 4 days at room temperature, and up to 3 months in the freezer. Hope that helps! A question for those that substituted the 3/4 cup of buttermilk with coconut oil & vinegar. Did you use equal parts of both to make up for the 3/4 cup of buttermilk? Also, what brand of vinegar is gluten free? I think you meant sub in coconut milk and vinegar (not coconut oil)? To make the dairy-free buttermilk, add the same amount of coconut milk (3/4 of a cup), but not full fat as it will be too thick, and add in 1 teaspoon of white vinegar or apple cider vinegar. Let them mixture sit for 5 minutes before adding it to the batter. It will help it thicken up and get lumpy, similar to buttermilk. Use dairy-free milk in the glaze. I am not sure why but mine came out like biscuits, heavy, and dense. I followed the recipe exactly. Not due why they didn’t work. Sorry to hear that. They should not have been dense. What flour blend did you use? How did you measure out your flour? These are soooo good and kid approved! Our Saturday morning tradition of donuts just got healthier:) thank you! If I knew how to attach a picture I would . I’m so happy to hear these donuts are kid approved 🙂 Thank you for stopping by and letting me know. Have you tried my cinnamon sugar donuts yet? We made some this morning for my daughters birthday.